We are excited to welcome a new face to our office, our marketing and communications intern, Lara Winnington-Ingram! For the next six months, Lara will be working on all internal marketing initiatives, so keep an eye out for her on our social media channels, emails, and blog posts! Lara is in her final year of studies in Marketing Management at Edinburgh Napier University, where she is writing her dissertation on sustainability in a marketing context. On her first day in the office, we had the chance to learn a little bit more about her, and we’d love to share a small part of her story with you. How did you hear about Alterwaste and why did you want to get involved? I recently finished my work placement in Berlin with Uhlala and told myself I would take a year off from internships to focus on my fourth year of university and write my dissertation, on the topic of sustainability. When I came across the internship position at Alterwaste on LinkedIn and realised that it matched up perfectly with my career aspirations and dissertation topic, so I thought that it would be silly not to apply. 2. What does sustainability mean to you? It isn’t all about wearing bamboo socks and keeping worms in your kitchen. It’s just about paying attention to our environment, being aware and making small changes to our everyday lives to reduce the unnecessary amount of waste that we produce every day. 3. Do you do anything in your everyday life to contribute to sustainability? I am passionate about local produce and the notion of “nature to plate” in the kitchen. 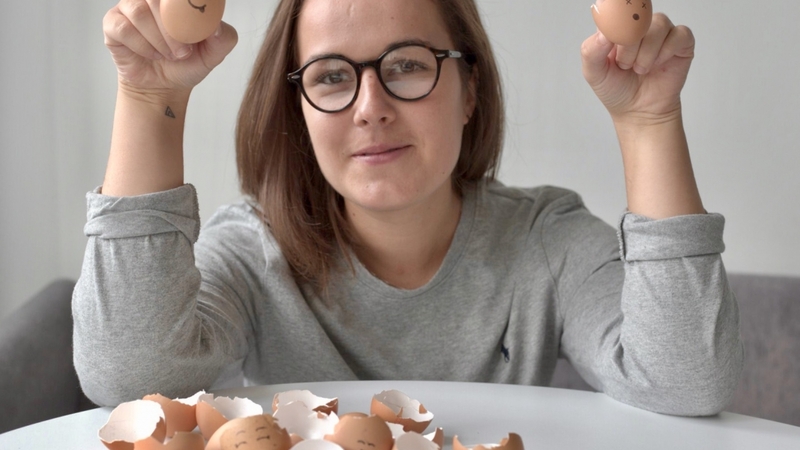 A term The Eggshell Project brings a whole new (literal) meaning to! I was lucky enough to be brought up growing my own food and educated on the topic of sustainability. Although it can be difficult to be sustainable as a student, I try my best to buy from supermarkets that stock local and regional produce. The community greengrocer DigIn, in Bruntsfield, is my favourite in Edinburgh. 4. How do you think Scotland is doing with sustainability? Having lived in Berlin for the past 6 months, I think Scotland has a long way to go! Berlin’s attitude towards a general environmental change for good is something that Scotland could learn from. The city’s returnable bottle policy, bicycle and public transport culture, 900km2 of green space, eco supermarkets and plant-based cafes all inspired me to come back to Scotland with a more sustainable mindset. It’s startups like Alterwaste that are bringing the environmental change that Scotland needs. 5. Are there any other sustainable products/services currently out there? The first thing that came to mind is Too Good To Go. It’s a free app that tackles food waste. Instead of restaurants throwing away their unsold food, they put it up on the app at a reduced price for users to pick up! Food is usually available when restaurants are closing, so it’s great for students who have been stuck in the library all day. It makes you feel a bit better about getting a takeaway! 6. How do you think marketing and sustainability can become more connected? More marketing and outreach is needed to promote sustainability and show that broader topics such as “green”, “recycle”, “renewable”, “ethical”, “conscious” and “environmentally friendly” are all part of sustainability. So many people are confused by the “S” word and it needs to be defined more clearly through marketing. 7. What are you hoping to get from this internship? I want to work with a purpose and I know that working with Alterwaste is going to give me that opportunity. I never wear odd socks.